Changing GDP To Reflect The Digital Economy? Previously on this blog and in my presentations over the last couple of years, I’ve pointed out that we are not adequately measuring what’s happening in the economy because GDP was developed during the 1930s to measure the industrial economy. In significant ways, it underestimates the value of digital products and services. So it was with interest that I read earlier this week (“Getting Creative With the G.D.P.”) that the Federal government will be adjusting GDP this fall to better account for the new economy. In March, the Government issued a report about this topic, entitled “Preview of the 2013 Comprehensive Revision of the National Income and Product Accounts: Changes in Definitions and Presentations”. Currently, expenditures for private R&D are not re­corded as final expenditures in the calculation of gross domestic product (GDP). Expenditures for purchased R&D are classified as intermediate inputs, and the costs of producing own-account R&D (that is, produc­tion of R&D by an enterprise for its own use) are sim­ply included with the other costs of production and are not identified as contributing to the output of a separate commodity. Investment in R&D will be presented along with investment in soft­ware and in entertainment, literary, and artistic origi­nals in a new asset category entitled “intellectual property products,” … The recognition of R&D as investment will improve BEA’s measures of fixed in­vestment, allow users to better measure the effects of innovation and intangible assets on the economy, and make the NIPAs more consistent with recommenda­tions in the SNA [the government’s “system of national accounts”]. In our knowledge-based economy, this is a sensible move that brings GDP accounting closer to economic reality. And while that may seem like an arcane shift relevant only to a small number of economists, the need for the change reflects a broader mismatch between our digital economy and the way we account for it. The change doesn’t fully address the under-measurement of the impact of the digital economy, but it does start to fix the problem. Now, as both the public and private sector make investments in expanding the digital sector of the economy, the return on those investments will become clearer. How To Be The Most Intelligent Community In The World? One of the questions I was asked about the awards given by the Intelligent Community Forum is what does it take to become an intelligent community. I’ll try to summarize what I’ve learned from participating in the ICF as a keynoter, juror and (before Cisco) a leader of a Top 7 community. Among the few hundred communities that apply in this contest, it is clear the first step is make sure the community has sufficient broadband. Almost all of the things that intelligent communities can do for and with their residents depend upon that connectivity in one way or the other. The way that residents interact with their government? How residents – from pre-kindergarteners to seniors – are educated? How well the physical aspects of the community are managed? How residents are kept healthy and safe? The local economy and the income opportunities for residents? … Just to name some of the evidence that ICF is looking for. Third, an intelligent community is reflected in the collaboration of all parts of the community. Is everyone getting the benefit of the technology? Are they working together to build a better future? Fourth, there is an intangible, but important, element: the culture of the community. Is there a sense that the culture of the community encourages innovation and encourages the sophisticated use of the technology that they have invested in? Fifth, ICF looks for progress. Many of the communities, who have been in the Top 7 and have won the top spot, did not win the first time they applied. But over the course of a couple or more years, they showed continued commitment to making themselves intelligent communities and they showed great progress. None of these five factors should be all that surprising. Of course, as we’ve seen, succeeding at each of these takes a community effort and leadership that is both visionary and effective. Taichung City was selected as the winner. Does Innovation Destroy Or Create Jobs? The Intelligent Community Forum just completed its annual summit, which celebrates the Top 7 most intelligent communities in the world. These are the global leaders who have already made investments in broadband and in community building – and who are now looking to see how they can build on those advantages. This year’s theme was innovation and employment, so I was asked to give the keynote presentation on the question of whether innovation destroys jobs and how sub-national governments should respond. The current argument that technological innovation is killing jobs has a long tradition, going back to the Luddites. But today we even have that herald of the Internet age, WIRED Magazine, portraying a near term future in which robots do all the work. I pointed out that there is still a lot of work to be done whether or not robots are “on the job”, for example curing diseases. More relevant to the question is whether the new kinds of work that innovation makes possible can be handled if people do not have the skills needed for that work. The need for training is obvious, but my focus was on the need for life-long learning for the adults, rather than the usual investment in K-16 educational institutions. In building a platform for lifelong learning, local governments can draw upon the numerous online resources for learning. Indeed, the local public libraries should be given the task of organizing and making sense of all of these online learning opportunities. Another, little discussed part of the employment picture is the relative inefficiency of the labor market itself. I suggested that, at least for their own metro areas, these local leaders use or enhance some of the new software that better matches the talents and temperament of their residents to the needs of the economy. Any discussion of innovation and jobs also needs to provide the big picture, the context of what is happening. So I briefly summarized my work on the future-oriented economy, with its twin trends of (1) a more service-oriented and digital (intangible) work and (2) ever increasing high quality visual communication over the Internet that enhances collaboration among people across the globe. Among the several implications of these trends is that the nature of work itself is changing. People will still have lots to do, but they will not necessarily be making a living in a traditional 9-5 job at a fixed work location. Innovation is one word with two forms. One, that Clayton Christensen called “sustaining innovation” is the kind of innovation that does increase productivity so that fewer people are needed to do the work – in other words, jobs decrease. The other is what he calls “disruptive innovation”, which can lead to the growth of new industries and companies providing greater income for everyone associated with that growth. Clearly, it is this second kind of innovation that public officials need to encourage. In an excerpt from Steven Johnson’s TED talk on “Where Good Ideas Come From”, the audience was reminded that “chance favors the connected mind” and innovation is really a network phenomenon. This is reflected, as well, in the open innovation movement among many corporations and even the US Government. To accelerate disruptive innovation and the economic opportunities it can generate, local governments need to connect their residents to the global economy, global flow of new ideas and new services. Successful innovation also requires a supportive culture, including accepting the failures that are part of innovation and experiment. Failure is something that many public officials feel comes with a high price, although the historic success of public sector innovators tells a different story. And, of course, the best path for disruptive innovation is not huge projects that require huge investments, but many smaller experiments. As the saying in Silicon Valley goes: “fail early and fast” to maximize learning from the experience. For their part, public officials can help build a local culture of innovation by using government itself as a model of innovation. They can even use the experience of being in their city as a continual reminder and inspiration for innovation. I gave some examples of simple, not very costly ways of taking even the less beautiful parts of a city and turning them into exciting, artistic lessons on innovation. Finally, using the 19th century example of the reaction of different cities to the railroads, I noted that they should not just wait to see what happens with technological innovation. Their decision to lead innovation or not to decide will have long-term consequences. There have been articles and much discussion over the last year or so about how the economic recovery and more generally technological innovation have not generated many jobs. Indeed it looks like technology is enhancing productivity to the detriment of job creation. Erik Brynjolfsson and Andrew McAfee, both of MIT, wrote a somewhat scholarly op-ed article in the NY Times several months ago that noted the traditional increases in jobs and income that have followed productivity increases no longer seem to be happening. See “Jobs, Productivity and the Great Decoupling”. WIRED Magazine devoted its December 2012 issue to the impact of robots on jobs and life. It led with an article by Kevin Kelly entitled: “Better Than Human: Why Robots Will — And Must — Take Our Jobs” and a sub-head “Imagine that 7 out of 10 working Americans got fired tomorrow. What would they all do?" 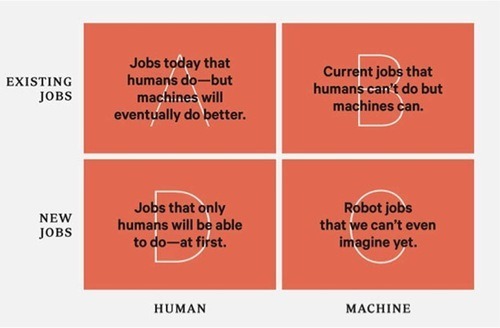 The magazine even presents a two-by-two matrix about jobs that makes the same point: many of us won’t have a job for very long. Despite the sensational nature of the issue, there is a lot more to this question than robots and technological advances. One small provocative aspect has only begun to get attention – maybe the traditional, 9-5 job in an office or factory is just disappearing. So Douglas Rushkoff on CNN’s website had an article entitled ”Are Jobs Obsolete“ in which he argued that the standard industrial-style job we’ve been used to is an historical anomaly and not likely to last in a post-industrial society. You can find books with similar themes and some self-help advice on what to do about the trend, such as "Making A Living Without A Job: Winning Ways For Creating Work That You Love” by Barbara Winter. This line of thought also counters the robots-will-do-all-the-work argument. As James Lee put it in the March 2012 Futurist, “Jobs are disappearing, but there is still a future for work." See his article ”Hard At Work In The Jobless Future“. By the way, this is not an altogether new idea. In 1994, William Bridges wrote "Job Shift: How To Prosper In A Workplace Without Jobs”. So part of – certainly not all of – the explanation for the elimination of jobs is their replacement by less structured forms of making a living. I’ll write more of the story in a future post. What Should Local Gov Do About Corporate Incentives? In my presentations on economic growth, I’ve pointed out that, given the new rules of the 21st century economy, the typical incentives that government uses to get corporations to bring new jobs to their area are rapidly declining in effectiveness. Yet these incentives add up to a huge number – now estimated at $80 billion a year. Instead, I’ve suggested that at least a fraction of that money be spent in more effective, future-oriented ways. These alternative ways include connecting local entrepreneurs to global partners, resources and markets, as well as efficient lifelong learning opportunities for adults so they can increase their potential incomes as individual players in the economy. Some of these ideas are parallel to the small, but growing, movement of local officials called “economic gardening” in contrast to the industrial era “economic hunting” strategy that is still the normal approach. So it was with great interest to see the front page of the New York Times this Sunday, which began a three part series on the “UNITED STATES OF SUBSIDIES – A series examining business incentives and their impact on jobs and local economies”. Today, General Motors’ Willow Run plant in Ypsilanti Township, Mich., stands empty and silent. The storied facility made bomber planes during World War II and then automobiles after being bought by G.M. Ypsilanti gave G.M. more than $200 million in incentives for Willow Run and another plant there — which has also been closed. In the end, the money that towns across America gave General Motors did not matter. When the automaker released a list of factories it was closing during bankruptcy three years ago, communities that had considered themselves G.M.’s business partners were among the targets. The cost of the awards is certainly far higher. A full accounting, The Times discovered, is not possible because the incentives are granted by thousands of government agencies and officials, and many do not know the value of all their awards. Nor do they know if the money was worth it because they rarely track how many jobs are created. Even where officials do track incentives, they acknowledge that it is impossible to know whether the jobs would have been created without the aid. “If you’re looking at the competitiveness of a region, the most important thing a region can do is to focus on education. And this use of incentives is really transferring money from education to businesses.” Donald J. Hall Jr., Hallmark C.E.O. Workers are a vital ingredient in any business, yet companies and government officials increasingly view the creation of jobs as an expense that should be subsidized by taxpayers, private consultants and local officials said. For towns, it became a game of survival, even if the competition turned out to be a mirage. What Is An Appropriate Strategy For Mid-Sized Cities? Wednesday, this week, there was a conference in Puerto Rico, on “The Role of Cities in a Global Economy”. The New York Fed Bank, in part, played a role in the conference and suggested that I be invited to speak because of my work on economic growth. The conference materials had a predisposition toward cluster strategy; “agglomeration” was a frequently used term. Along with this predisposition, there was a feeling that metropolitan regions should learn from the past successes of cities like New York. So I first raised what I thought was the big open question: how should a place like Puerto Rico (and its San Juan metropolitan area) advance the economic well being of its residents? While New York succeeded in the industrial age because it had the largest agglomeration of resources, this does not mean that Puerto Rico should try to imitate such a large metro area now. Rather than trying to “win the last war”, there is an opportunity for Puerto Rico to find a leading role in the future economy by not playing according to industrial era rules. At least some of Puerto Rico’s economic strategy should focus on this future. Carlo Ratti, Director of MIT Senseable City, expanded the vision to include Public Participation 2.0 and reminded people again that when technology becomes ubiquitous it becomes invisible and most useful. Anthony Townsend, Research Director of the Institute of the Future, talked about clusters forming the foundation for economic growth – but innovation clusters. This is not about the traditional one-industry physical clusters, but instead about networks of creative people. The conference brought together many of the thought leaders about the future of cities and it was also inspiring to see an audience that intends to act upon what they learned to leapfrog their economy. Will Higher Education Repeat The History Of Theaters? Nearly every university administrator and many professors that I talk to realize there is a potential sea change occurring in higher education. There is, of course, tremendous uncertainty as to where this is all leading – and a hope that, wherever it leads, these folks will retire before they have to go there. One possible analogy to the problem facing higher education is to compare it to the challenge faced by theater in the 19th century. During that period, every city of any consequence had one or more theaters that were the venue for actors, singers and other live performers. Then along came recorded music and the movies and ultimately television. Those technological innovations made it possible to deliver performances from the best actors and singers without requiring them to be physically present in each city. In addition, the revenue that this form of recorded entertainment could generate was much greater than that of any local live theater. Movie and record companies used that extra revenue to provide “production values” and elaborate staging that isn’t possible in the local live theater. The result: most of those live stage theaters disappeared or were converted into movie theaters. Now, technology makes it possible to deliver on a large scale at least that part of a college education that consists of watching a professor deliver lectures in front of a classroom. Again, it is unlikely that the local university or college will be able to match this global delivery or the “production values” that could enhance these online courses. Of course, we still have Broadway (plus a few successful regional theaters). So too there will be Harvard, MIT, Princeton, Stanford and the like. But most colleges may find it increasingly difficult to justify their continued existence using the current approach. One significant barrier that has been holding back this transformation is that colleges have had the combined responsibility of both delivering an education to their students and certifying that their students mastered that education (i.e., they provide college degrees). If that connection starts to break and there can be an independent respected institution that would certify whether someone has mastered a topic, we will see lots more experimentation and rapid change in higher education. Thus it is interesting that in today’s New York Times there appeared an article “Free Online Courses to Be Evaluated for Possible College Credit” at http://www.nytimes.com/2012/11/14/education/moocs-to-be-evaluated-for-possible-college-credit.html The report notes that the the American Council on Education (higher education association) and Coursera (a MOOC consortium of thirty three universities, including Stanford and Princeton) will be evaluating whether to offer college credits for MOOC courses. Another MOOC consortium, EdX, already provides a certificate of completion. The change is starting to accelerate. A couple of years ago, I met with several top officials in a major state government at the peak application time for Federal broadband funds that were part of the stimulus program. Although the Governor was committed to ensuring that 95%+ of the homes in his state would have broadband and his staff all agreed to this goal, many of them couldn’t really say why this would be a good thing. So, in a moment of frustration in the meeting, I spent maybe twenty minutes rattling off dozens of possible things people could do if broadband were a statewide reality. That frustration led me to start a list called “1001 Uses For Broadband” – partly, in homage to the ending of the classic late 1980s thriller “F/X” and SuperGlue. Fast forward to last week, where I met with the OneMaryland network and Howard County officials for another broadband brainstorming session. Using stimulus money, they’ve created one of the more interesting broadband projects, partly due to a very innovative executive, Ken Ulman. To get the discussion going, I put together a presentation based on the 1001 uses approach. I’ll be sharing these ideas on this blog over the next few months, organized by category. I hope that you and others add to the list. It really won’t be hard. The key is to think about what broadband can do for a community, county, city, state or nation. The way to frame the question is: what can people do that has been hindered by travel or other significant costs? Next: How Can Broadband Get People Healthier? Are We Encouraging The Wrong Kind Of Entrepreneurship? One of the most interesting centers for new ideas about economic growth is the Startup Genome project. (See http://www.startupgenome.com and http://blog.startupcompass.co ) This is one of the few places that moves beyond breathless, anecdotal stories to real analysis of the factors in the success and failure of startups. Its leader, Max Marmer, published an interesting blog on the Harvard Business Review site a couple of weeks ago. It was entitled the Danger of Celebritizing Entrepreneurship (http://blogs.hbr.org/cs/2012/10/the_danger_of_celebritizing_en.html). Like Peter Theil (see my earlier blog post at http://njacknis.tumblr.com/post/28980374812/what-kills-innovation), he is concerned about the trivialization of the entrepreneurial process and the celebration of business ideas that are just not that significant. In turn, this causes a decline in the number of truly important ideas. More recently, he has moved the discussion to the convergence of business entrepreneurship and social innovation. See Transformational Entrepreneurship: Where Technology Meets Societal Impact ( http://blog.startupcompass.co/transformational-entrepreneurship-where-techn-11064 ) and Reversing the Decline in Transformational Ideas ( http://blog.startupcompass.co/reversing-the-decline-in-transformational-ide ) from earlier this year. This is useful reading both for entrepreneurs and those public officials whose economic growth strategy is focused on entrepreneurship – which should be one of the key foundations of that strategy in our new economy. The Kauffman Foundation sponsored a study of the companies in the Inc. 500 over the last thirty years. State and local government have had way too much unwarranted belief in physical clusters, especially of high tech industries. In the next thirty years, these trends presumably will get stronger as Internet collaboration and video tools become more widespread. So-called high-tech sectors constitute only about a quarter of fast-growing Inc. firms: IT (19.4 percent) and Health and Drugs (6.5 percent). Other major sectors include Business Services (10.2 percent), Advertising and Marketing (8.5 percent), and Government Services (7.3 percent). Thus, innovations and growth of firms come from a wide range of industries. Among large metropolitan areas, Washington, D.C., has the highest concentration of Inc. firms in terms of the number and normalized score, with more than 46 percent of them in Government Services. This rise of D.C. high-growth companies is persistent in the last two decades, regardless of party administration, and demonstrates that, ironically, outsourcing federal government services plays a large role in the growth of private firms. There are innovative, high-growth companies outside of the usual suspects of technology places, like Silicon Valley. Such surprise regions include Salt Lake City (second), Indianapolis (sixth), Buffalo, N.Y. (eleventh), Baltimore (fifteenth), Nashville (eighteenth), Philadelphia (nineteenth), and Louisville, Ky (twentieth). These clusters of Inc. firms, including those in the area’s so-called Rust Belt Region, suggest that population growth in the region is not necessarily a factor for growth of firms. While regional development literature suggests the presence of venture capital investment, high quality research universities, federal R&D funding (such as SBIR), and patents are good sources for growth, Inc. firms had no correlations with these factors. In contrast, we find that the presence of a highly skilled labor force is important for concentration of Inc. firms. The Ewing Marion Kauffman Foundation released an analysis of the Inc. 500 list, an annual list of the 500 fastest growing companies in the United States, between 1982 and 2010. The report includes data visualization tools allowing readers to examine specific counties and states. The report’s authors found there was no correlation between the factors traditionally cited as drivers of growth (such as venture capital investment, high quality research universities, federal R&D funding, or patents) and the existence of Inc. 500 firms. The concentration of firms in states largely remained constant across regions and states in the last thirty years despite varied economic development programs. Only a handful of states made radical moves in concentrations of firms, with Washington D.C. representing the largest jump. Among large metropolitan areas, Washington D.C. has the highest concentration of Inc. 500 firms, with half of firms providing government services. The authors also found that the fastest growing companies were located in a variety of regions and industries, rather than in the high-tech industries often targeted by state economic development programs. Although cities like Austin, TX that are traditionally associated with the high-tech industry were in the top 20 metropolitan areas according to number of Inc. 500 companies, rust belt cities like Buffalo, NY and Baltimore, MD also made the list. Outside of Washington D.C., the Inc. 500 firms were found in IT (19.4 percent), health and drugs (6.5 percent), business services (10.2 percent), advertising and marketing (8.5 percent), and government services (7.3 percent). I’ve been quiet on the blog for the last few weeks during the summer doldrums and vacations – a great time to catch up on reading books, including some that were published a while ago. Here are quick highlights of some of my more interesting summer reading. This book describes how we should be thinking about life in the 21st century. In many instances, Davidson completely upends well established patterns of the industrial era. She is well known in academic circles as a neuroscientist and former dean at Duke University, where she introduced the widespread use of technology among students. The book covers a variety of topics, including education, work and aging. With so many people saying they are innovative, Harford shows how those people will not succeed at innovation unless they develop some patience, even an appetite, for the failures that often precede success. He provides fascinating examples. In this year’s unusual election of ideological contrasts, there has been an underlying (and often visible) debate about the views of the Founding Fathers when they wrote the constitution. Rakove’s book provides the details of their debates and their own ambiguous feelings about many of the decisions which we now treat as is handed down in stone by the supreme being. These were politicians with great insight into political behavior and how it might be shaped. Their concerns were well-founded, since some of what they worried could happen has happened. But, in part, they were reacting to experiences in the 18th century that we do not share today. It also revealed the Founding Fathers’ concerns about those who sought some clear original meaning in what they wrote – and when their short term political objectives encouraged them to make the same kind of arguments about original meaning that politicians today make. Is innovation dying? If yes, what is killing it? This is a bit of follow up to my blog post last week. Peter Thiel, well-known tech entrepreneur, has for a while argued that technology innovation has severely decelerated (with the exception of the computer business). He cites the rapid slowing of the last 200 years of progress in the US and Europe, noting that while existing technology is spreading elsewhere through globalization, new technology is not leaping forward in the US. He feels we’ve forgotten how to innovate. Thiel is a libertarian and identifies government regulation as the proximate cause of this deceleration. No doubt, bad regulation exists and bad regulations can be a heavy hand on the wheels of progress. speaking of “developed” versus “developing nations” is implicitly bearish about technology because it implies some convergence to the “developed” status quo. As a society, we seem to believe in a sort of technological end of history, almost by default. This has bothered me too, but it points to a different cause than regulation and a set of solutions that involve the government. As long as we measure our economy in industrial terms (GDP) and give short shrift to the value of post-industrial, often intangible, goods and services, we will persist in this sense of stalled progress. If the problem is that we are telling ourselves that leap-forward innovation is at an end, then we need leaders who can help develop and propagate a new vision of the future – and who can then help change the culture that has created the problem. This is true leadership, not the 5-point policy programs that result in a press release and not much else. Another culprit is the “shareholder is always right” mantra, which has become the American legal standard over the last couple of decades. This fiduciary standard has discouraged CEOs from making big innovation bets with long-term returns, since most of their shareholders have adopted a short-term outlook. For a good assessment of this and other issues, see Lynn Stout’s article, Challenging the Long-Held Belief in ‘Shareholder Value’ where she describes the negative consequences when companies are run with the primary decision making criteria being maximizing return to shareholders. This isn’t the whole story, but it points to a fundamental weakness in the way we think that is slowing us down. What will it take to change that? If you have ideas, let us know. He notes that there seems to be a lack of big new ideas in the tech industry and suggests that this is because there is not enough diversity in the founding teams of new enterprises. In a recent presentation, I noted that we’ve learned about the importance of cross-pollination among disciplines for true innovation. And then I made the point that many of the “innovation clusters” planned by governments instead aim to drill down into one very focused domain of knowledge – which might mean they won’t get the innovation they expect. The author’s argument about the homogenous nature of Silicon Valley startups is perhaps another example of this pattern. All of those public officials who have dreams of duplicating the past success of Silicon Valley should take note. A few weeks ago, in a post “How Intelligent Communities Get Fit For The Future Innovation Economy”, I summarized my keynote presentation at the Annual Summit of the Intelligent Community Forum. As always, please send me your comments and observations (njacknis@cisco.com). I was asked to lead a panel on economic development at the Annual Meeting of the National Association of Counties last Friday. My task was to provide some background on economic trends for the panelists who were to speak on what their communities are doing. 3. Subsidize the building of places that concentrate a large number of jobs, like office buildings, factories, etc. As a result, incentives to big companies don’t work well because those companies can no longer deliver or move lots of jobs. In addition to explaining why this is, I gave examples of the failure of incentives. In a sense, there is a movement away from the world of Coase to the world of Shirky. Ronald Coase, an economics Nobel Prize winner, developed the theory of the firm – why large enterprises emerged in the industrial era and were more efficient in many ways than the marketplace itself. Clay Shirky of NYU has written about how the Internet can provide the means of collaboration today that only the large industrial corporation used to provide. As a result, in their thinking about economic growth, governments should focus on small companies and fluid teams as the individual increasingly becomes the key unit of economic activity. The second part of the traditional strategy has been to create clusters. However, as some major economic studies have made clear, the value of physical clusters of the same industry is waning. Moreover, the more recent talk of “innovation clusters” would seem to fly in the face of what we have learned about how innovation happens. Innovation is more likely to occur from people in diverse fields exchanging ideas than people who are all narrowly focused on the same domain of knowledge. Then finally there has been the practical equation of real estate development with economic development. As noted in an earlier blog, companies require less commercial real estate space per employee. Work at home and flexible co-working spaces are the substitutes and these don’t look like traditional office towers. Physical real estate itself is changing and become more a blending of virtual/physical. So perpetuating more traditional office or other industrial real estate projects would not seem to be a good future-proof investment of public funds. I suggested that public officials needed to shift their thinking about what is economic success. Is it the total revenues of companies that might happen to have an address in your county OR is it the amount of income and wealth of its residents? To put it another way: if you had to choose, which is the better economic picture for your community – corporate skyscrapers or headquarters in downtown, but a median household income of $40,000 per year OR no skyscrapers, but a median household income of $100,000 per year? To me the answer is clear – the latter option to both questions. My talk was followed by presentations from the two coasts of the US. First, Ira Levy of Howard County, MD described that county’s approach with its emphasis on entrepreneurs, education, etc. We didn’t do any coordination ahead of time, but his presentation was very much in line with the ideas I presented in the opening talk. And, of course, he had to point out that Howard County has a median household income of $105,000. A similar story came from Robert Ross of the San Mateo (CA) Council, who referred to the trends that I had outlined. These required a change in strategy even in the heart of Silicon Valley. Please feel free to contact me at njacknis@cisco.com if you want a copy of the details of the presentation. Last week, the BBC had a report on New York City’s award to a consortium of universities, led by Cornell, for the building of a new applied science university that would focus on a couple of key industry clusters. The goal of the city is to encourage innovation and businesses that could be spun off of the university research. The dots on this map and others like it from other cities don’t necessarily imply the ecosystem functions the way people think nor is the real ecosystem limited to the dots that are on the map. These maps sometimes are like Rorschach tests that reflect the mental model applied to them. The mental model at work here is that government can build an innovation cluster around a narrow domain of knowledge, whether it’s biotech or information technology or whatever. The city leaders hope to have their own version of Stanford University, which has had the reputation as the ideal of 20th century innovation. Of course, it is an open question as to whether that 20th Century model is the best approach for the 21st Century. This open question will be answered, in part, by knowing whether innovation clusters. Also, in what could be described as the de-clustering of the financial industry, the New York Times this week reported (http://www.nytimes.com/2012/07/02/business/finance-jobs-leave-wall-street-as-firms-cut-costs.html) that many “Wall Street” firms were moving substantial number of employees far away from Wall Street or even Manhattan. Clearly they don’t necessarily think that physical clusters are required for business success or innovation. Indeed what we know about how innovation occurs would lead us to believe that a narrow focus is the wrong approach. Instead, innovation is most often the result of cross-pollination across disciplines. With that in mind, perhaps these cities would be better off providing their residents with connections to the flow of new, diverse and cross-cutting ideas that are already occurring around the world – and the business services that will help turn those ideas into successful businesses. I doubt this 21st Century model would take the parochial form of a large, institutional building project. Last Tuesday, June 19, the collaborators of the Gotham Innovation Greenhouse met at the WHITE BOX gallery on Broome Street in NYC. Dorothy Nash presented a project to retrieve and extend translation software developed for Haitian Creole after the quake in 2010, and develop the tools further to provide services for Brooklyn’s Haitian Diaspora community and their relatives in-country. Dana Karwas presented BLDG BLOK (http://www.bldgblok.com/), an app to socialize and identify the history of the world around a person. As a modern cartographic tool, it aggregates unique data sets to tell the story of a particular place. The maps explore the confluence of architecture, landscape, literature, news, cultural and social history, film/tv, and future visions for the cityscape. She and her co-founder hope that the connections that are sparked will inspire new thinking and ideas that could change the world. Andres Fortino presented CREDS, an idea for a central repository of educational and other credentials that a person needs during the vetting process for a job. David Turnbull presented his idea for an East River Think-Place, a blended-reality public construction with an initial emphasis on soccer as a tool of engagement. There was also discussion about next ideas and expanding the current group of GIG collaborators. If you have an interest in participating, either in New York or virtually, please contact me at njacknis@cisco.com. More information about GIG can be found at http://www.gothaminnovationgreenhouse/wordpress. A few days ago at the 80th Annual Meeting of the @USMayors, I was asked to elaborate, for its Council for A New American City, on one part of the future-oriented economic growth strategy I have developed for them – the blending of physical and virtual space to create new destinations and experiences that will attract and retain people in this century. I described blended spaces for working, shopping and, in general, living in an urban area. First, cities need to enable new, more informal workspaces in which most people will earn a living in the future. These can be in formal co-working spaces or in homes. But they might also be in hotel lobbies or in parks (like Bryant Park in New York City that is equipped not only with Wi-Fi, but also electrical outlets along the edge of the grass for when your laptop needs recharging). Second, cities should enable new virtual shopping options, which might be part of transportation systems, on the street, or in any public space where many people go by (and could buy). The deployment of virtual shopping has direct economic benefit to the city government because it can increase sales tax revenues, increase revenues from advertising in public spaces (like bus stops) and even allow the city to get a piece of the sales transaction that occurs in its facilities. And, at least until it becomes more common, virtual shopping can provide people an exhilarating “experience” that adds to the quality of life in a city. Beyond shopping, I gave several examples of how blended virtual/physical space can improve quality of life – how it can provide a “wow” factor for a city. For example, the mayors were intrigued by 3D projections on buildings. I referred, for example, to how Chattanooga could project on downtown walls or streets what was going on in its large freshwater aquarium at night when the aquarium is closed. I also reminded the mayors that quality of life includes the experience of being a citizen in a city. That experience goes beyond merely getting city services on the web, but includes active citizen engagement in the co-creation of public policy and co-production of public services. Finally, I noted that any city can implement at least one of the ideas I presented, without a big capital project. Compared to lots of other projects, these had little cost – and sometimes no cost at all to the city government. So the final guidance was: go ahead & experiment! If you’re interested in getting a copy of the whole presentation, please feel free to contact me (njacknis@cisco.com). I had the honor of making the keynote speech at the Intelligent Community Forum’s Annual Summit, where the Top 7 most advanced cities/regions in the world competed to be designated the world’s best. For the first time in ten years, an American city won – Riverside, California. Congratulations to Mayor Ron Loveridge and CIO Steve Reneker! So what can you tell people who already are ahead of the competition? You tell them how they can step up their game even more and get fit for the future innovation economy. Plan for the future way that most people will earn a living. This means recognizing the shift to tangible services, work from home and other informal work spaces, etc. Offer a video/collaboration platform for innovation, which means building both physical/communications and human infrastructure. Innovation is a result of collaboration and the free flow of ideas, not the work of some isolated genius. Today’s Internet enables creative people to engage with each other despite great distances and each community should ensure that its residents have the tools to do so. I pointed out that the best university research all of the world is available through the Internet and that their communities may already have entrepreneurs with the skills to commercialize research, so before they try to recreate a Stanford or Princeton University, they should make sure that that local entrepreneurs have access to academic research elsewhere. Link to a global ecosystem for dependable economic growth. I suggested they establish an entrepreneurial extension service, modeled on the US Agriculture Extension Service which greatly enhanced American agricultural productivity. Similarly, I recommended that the public libraries should be tasked to organize the vast amount of free training and courses online in a range of subjects from business knowledge for entrepreneurs to technical skills – and become the corporate reference library for those without big corporate resources. Provide people a quality “experience” so they stay. I noted first that quality of life includes the citizen experience, so residents need to be engaged in community decision making and even the delivery of public services. As the physical and virtual worlds will become intertwined, make new destinations in a city that blend the virtual and physical. I gave several examples of how this is already being done around the world. Shift some investments from the old approach to this new world. Take some of the money spent on incentives for large companies and shift it to strategies that help entrepreneurs and individual residents flourish in a global economy. The full presentation and video will be on the ICF website in a few days and I’ll let you know the exact web address as soon as its there. The article highlights the greater collaboration and innovation that have resulted from the use of smaller, less traditional office space. I do have the sense, though, that these newly discovered desirable features amount, in part, to making a virtue of necessity. The Great Recession of 2008 made people think that the vacancy rates of commercial office space was a reflection of the poor condition of the economy. But the reduction in the need for traditional office space has been a trend for a while. The current rule of thumb concerning office space per employee – 200 square feet per employee – is shrinking to just 50 square feet by 2015. As early evidence of the trend, office tenants renewing their lease nowadays often cut their total space by around 10%-30%. In past blogs, I’ve pointed out how, traditionally, city plans and taxes have heavily depended upon office space. Commercial real estate has been the goose that has laid the golden eggs for local governments around the US. The trend of reduced space per employee will clearly have consequences for those cities that do not start shifting their assumptions about the way the economy will increasingly work. Those cities will also find their own financial success increasingly misaligned with the financial success of their residents, who are quickly adapting to the new work environment in the home and other places that don’t look like offices. That is not a good situations for mayors and other elected officials. Welcome to my website. It’s still under development, but it will feature my blog and other items of interest. The blog explores the future of the economy, government, business and knowledge. It will be a combination of my own thinking and pointers to interesting stuff that I see. You can follow me (@NormanJacknis) on Twitter to learn when blogs are posted. Robots Just Want To Have Fun! More Than A Smart City? Are Any Small Towns Flourishing?